Stan the Man! This cameo is truly a blink and you’ll miss it moment and you can see why animator Nick Kondo’s tweet says to have fun framing through the movie when it hits home video. Trying to spot this cameo while the movie is running would be like playing Where’s Waldo, with the page flipping every second. Going frame by frame is the only way you’d spot Stan Lee on the train in this sequence. This cameo is a great one too. Not only does Stan Lee appear where we don’t expect to see him, but he is also doing the web shooter pose with his hand, which he was often photographed doing on red carpets. To see him doing that in a Spider-Man movie (and arguably the best Spider-Man movie) based on the character he created with Steve Ditko is just perfect. Spider-Man: Into the Spider-Verse directors Bob Persichetti, Peter Ramsey and Rodney Rothman said that every animator wanted a chance to animate Stan Lee, so he appears in several crowd shots. This should provide a fun challenge for fans when the movie releases on home video. This cameo shows that they were being truthful and that the word ‘challenge’ was quite appropriate for this task. I expect many a Marvel fan will have their work cut out for them on this hunt come March. Of course, rewatching Spider-Man: Into the Spider-Verse multiple times sounds like anything but a chore. Stan Lee’s sad passing means that he won’t be filming any more comic book movie cameos and we’ll soon observe the last of him onscreen. But Spider-Verse cameos like this one show a cool way he could still show up in the movies, at least the animated ones, like Spider-Man: Into the Spider-Verse’s sequel and spinoff. Stan Lee obviously wouldn’t speak, but would just appear in the background as tribute and as a reminder of how even though he is gone, he lives on through his creations. Stan Lee’s presence and impact is all around if you’re willing to look. Spider-Man: Into the Spider-Verse arrives on Blu-ray, 4K and digital on March 19th. 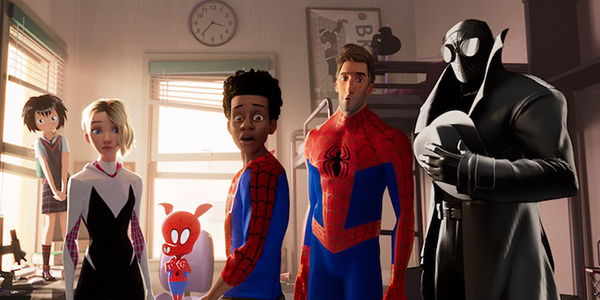 Before that, Spider-Verse will compete at the 91st Academy Awards where it is nominated for Best Animated Feature Film. Stay tuned to CinemaBlend for the latest movie news and check out our release schedule to see all the movies you can look forward to in 2019.